I finished my quilt along 9 patch top before we left last week. I really really love this quilt. As you can tell I changed the pattern a little bit. (its supposed to look like this ) Me+sashings = grumpy……so I changed it. Lazy lazy lazy lazy lazy me. Right now this quilt top is buried in the depths of the car. Did I mention I’m really sick of traveling? I am. My feet are numb from the AC blasting in the car, I’m sick of eating junk food, gross public restrooms and counting bug splats on the windshield. We’re in Portland now, which I love love love Portland, but I’m still ready to get unpacked and setteled. And I’m going through sewing withdrawls, I’m starting to get the shakes and lash out at my loved ones…..must…..sew…soon. nice quilt! Safe travel! I love the polka dots fabric you used. oh man! i love this. what great fabrics you have! and i'm with you on the sashing thing. i love the look of sashing. i hate sewing sashing. great colors. great quilt. great version! the sashing make me grumpy too…but i'll try with the "one a day quilt a long 2". this is such a pretty way to do the 9 patch…. I am stalling on finishing mine because i hate to do sashing. it never goes well. Wow! I love your nine patch quilt. The white squares really make the others pop. You are not lazy, just creative. Its great! I just started the 2nd round of the same quilt along and I love your idea of doing the white blocks instead of sashing. Hmmmmm, now I don't know which to do. Wonderful– I hate sashing, too, and this was a great way to get around it! One thing I learned in a hand quilting class, was to always have a little project that you can keep in a ziploc in your purse. 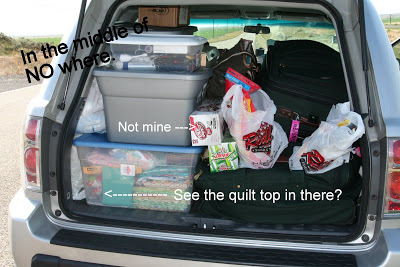 It was years ago, and I am still finishing the quilt because that is the only time I work on it, in the car, at the Dr. Etc. Hexagons are also good for road trips (for future) Glad you arrived safely at your destination! I'm laughing at that picture of your car. You always crack me up! And I like the changes you made to the nine patch quilt. Very cute! Safe travels, hope you get to sew again soon! Have a safe trip and be sure and stop at Fabric Depot in Portland – you can fit some fabric in I'm sure. I love your version! The white blocks make it very fresh. Really cute! I love how you changed the border – very nice! Very cute! I am working on a no obligation 9 patch when I have time. I even started it before the official quiltalong. I'm going to try to think of ways to change it up too. I like yours better! Your choice of fabrics always amazes me. Its beautiful, I love it! Hope you are having a safe trip! The quilt looks great! So fresh looking. I am in round two and actually making my blocks this time. I LOVE it! It has so much movement and energy. I'm going to put mine together like yours. I just LOVE lots of white in a quilt! Often folks with sewing machines are homebodies by nature, I think. Traveling always looks fun until you realize you can't sew and drive. I used to joke about mounting my sewing machine to the dashboard of the car when my kids were young and on sports teams or in theater productions. I like your quilt! Did you see the 9-patch version at the Red Pepper Quilts blog? It also has no sashing. Here's hoping you get settled soon. 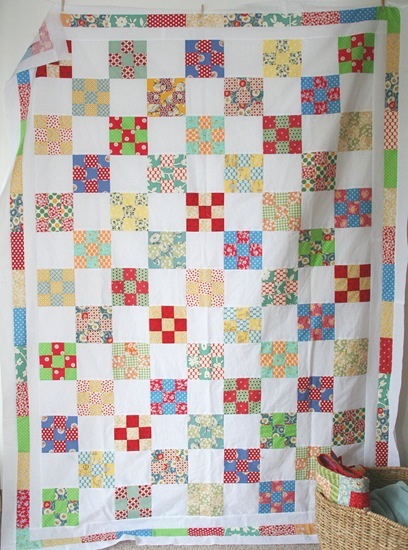 Beautiful, cheery quilt! Nice work. 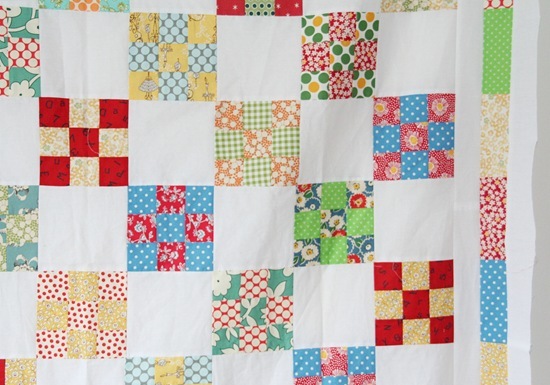 LOVE your lazy quilt top…ha! What a fresh, vintage look! Hang in there, little nomad…you'll have a home soon ;) Glad you are finding ways to post on the road! I love that the sewing stuff took up such valuable real estate. What a good idea to avoid sashing! I just started the second round of the 9 patch quilt along. The first round produced such beautiful results that I couldn't resist. But my biggest fear was the sashing. NOW, I'll have to think long and hard about whether I'm going to do it the "right" way or your way! How's that Diet DP treatin' ya? I can't blame you. I hate sashings too. I thought I was the only one. They look so easy, but they come out so crooked. At least for me. I just L-O-V-E your version. In a sea of sashed quilts I am definitely going this route on my second time round with crazy mom quilts. Wow. Isn't it funny how a totally simple (and old) pattern can still look so great!? I like your version. Squares seem way easier than the sashing! I think this is my favorite of the 9-patch quilt-a-long quilts I've seen. Your fabric choices rock. (Love the American Jane!) And I like the way you used the white squares instead. Looks very fresh/funky but retro. Ooo. I think I need to use up my American Jane this way too! Thanks again for the lovely inspiration. Safe travels! Love your revised sashing, looks perfect! I like your quilt, the fabrics are just fun :) Welcome to Portland, enjoy your stay! I can't blame you for wanting to get home, it's exhausting having to travel. Your nine-patch is tres adorable! I'm currently struggling through sashing hades, and well, let me tell ya', things are NOT going to line up perfectly. Oh well. And, I second the Fabric Depot recommendation, although I must confess I dropped some serious change there about a month ago! Hope you're home and back to your sewing machine soon! Gorgeous! And I like your version just as much as the original. I like your version better. Looks great! it's gorgeous!!! i love how you changed it up. nice work!!! I love the quilt! No offense to AJ, but I think I like this even better than the sashing ~ but then, I am a simple girl…. i go through those sewing withdrawls too! i just got back from a short stay away and can't wait to get SEWIN! it's so cheerful looking! I really like it! Im loving our lack of sashing. I hate sashing too and am looking for an alternative. this may be it. Love this quilt! I'm not such a sashing fan, either. Seems like there are a lot of us out there! who does like traveling?? not me… i've had fun here in LA but i can't wait to get home! i like the change you made on your nine patch… sashing can take forever!